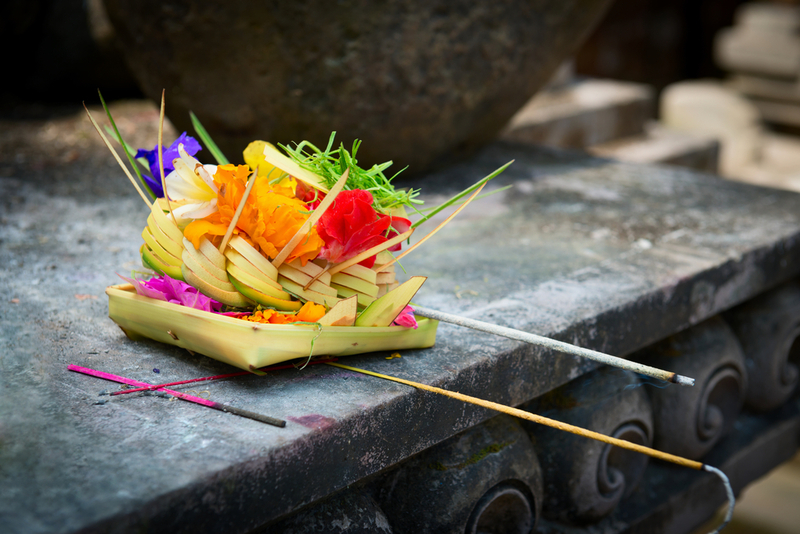 When you walk around in Bali while enjoying your holiday, you probably see at least one small square or round palm leaf made, filled with colorful flowers lying on the ground either in front of houses, shops or temples. Those things called Canang Sari, daily Balinese offerings. The phrase Canang Sari is derived from the Balinese words sari means essence and canang means a small palm-leaf basket as the tray. Canang Sari is the symbol of thankfulness to the Hindu god, Ida Sang Hyang Widhi Wasa. It is offered every day as a form of thanking for the peace had given to the world. Canang sari normally filled with colorful flowers. The colors of the flowers are white, red, yellow, blue or green. Those colors are not randomly chosen; they have different meaning and are placed in specific directions. White-colored flowers that point to the east as a symbol of Iswara. 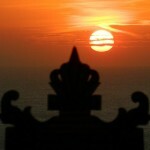 Iswara is regarded as one of the primary forms of God. He is also known as Shiva or Mahadeva. Red-colored flowers that point to the south as a symbol of Brahma. Brahma is often referred to as the progenitor or great grandsire of all human beings. Brahmā is traditionally depicted with four heads, four faces, and four arms. Unlike most otherHindu gods, Brahmā holds no weapons. He holds a scepter, a book, a string of prayer beads and the Vedas. Yellow-colored flowers that point to the west as a symbol of Mahadeva. Mahadeva means “Great god”. The main iconographical attributes of Mahadeva or Shiva are the third eye on his forehead, the snake Vasuki around his neck, the crescent moon adorning, the holy river Ganga flowing from his matted hair, the Trishula as his weapon and the Damaru as his instrument. Blue or green colored flowers that point to the north as a symbol of Vishnu. Visnu is conceived as “the Preserver” within the Trimurti, the Hindu Trinity of the divinity. He is depicted as a blue being, holding a Padma (lotus flower) in the lower left hand, the Kaumodaki gada (mace) in the lower right hand, the Panchajanya shankha (conch) in the upper left hand and the discus weapon Sudarshana Chakra in the upper right hand. Normally, Canang Sari stays for one night after it is being prayed and offered before it is being removed to be replaced with the new one. After all, Hinduism is very concerned with the relationship between humanity and the environment. Whatever comes from nature, it has to be back to nature. Trimurti means “three forms”, is a concept in Hinduism “in which the cosmic functions of creation, maintenance, and destruction are personified by the forms of Brahma the creator, Vishnu the maintainer or preserver and Shiva the destroyer or transformer. For a traditional Balinese woman, it is an obligation to know how to make Canang Sari and other offerings (called “mejejaitan”) because offering the Canang Sari is one of the important daily activities other than cooking, taking care of the children or cleaning the house. However, this term is not common in these modern days. Now, people can buy Canang Sari from traditional markets. If you see canang sari on the ground when you are walking around street, do not step over or step on it because it is considered as not respecting the culture and the religion. Especially the ones with incense that is still burning.